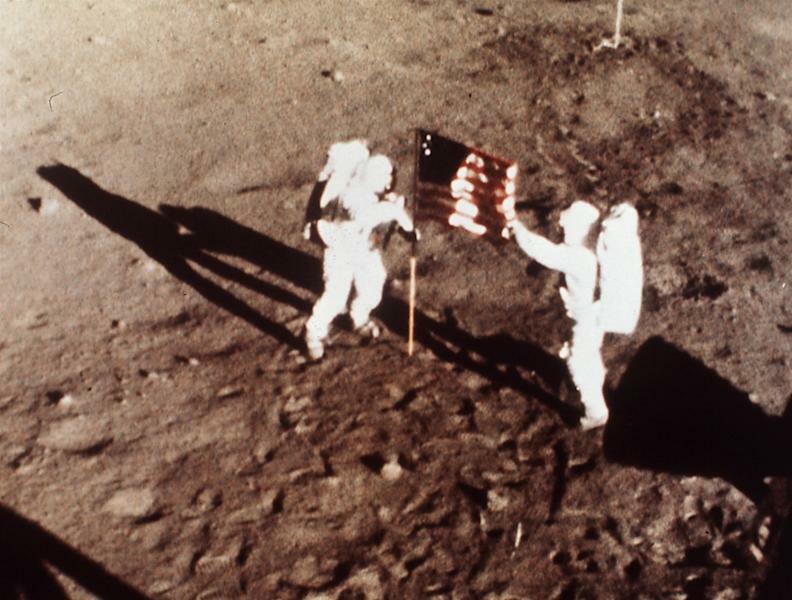 CINCINNATI (AP) — Neil Armstrong made "one giant leap for mankind" with a small step onto the moon. He commanded the historic landing of the Apollo 11 spacecraft on the moon July 20, 1969, capping the most daring of the 20th century's scientific expeditions and becoming the first man to walk on the moon. His first words after the feat are etched in history books and the memories of the spellbound millions who heard them in a live broadcast. "That's one small step for man, one giant leap for mankind," Armstrong said. He insisted later that he had said "a'' before man, but said he, too, couldn't hear it in the version that went to the world. Armstrong, who had bypass surgery earlier this month, died Saturday at age 82 from what his family said were complications of heart procedures. His family didn't say where he died; he had lived in suburban Cincinnati. He was "a reluctant American hero who always believed he was just doing his job," his family said in a statement. The moonwalk marked America's victory in the Cold War space race that began Oct. 4, 1957, with the launch of the Soviet Union's Sputnik 1, a 184-pound satellite that sent shock waves around the world. The accomplishment fulfilled a commitment President John F. Kennedy made for the nation to put a man on the moon before the end of 1960s. In those first few moments on the moon, Armstrong stopped in what he called "a tender moment" and left a patch to commemorate NASA astronauts and Soviet cosmonauts who had died in action. Although he had been a Navy fighter pilot, a test pilot for NASA's forerunner and an astronaut, the modest Armstrong never allowed himself to be caught up in the celebrity and glamour of the space program. "I am, and ever will be, a white socks, pocket protector, nerdy engineer," he said in 2000 in one of his rare public appearances. "And I take a substantial amount of pride in the accomplishments of my profession." Rice University historian Douglas Brinkley, who interviewed Armstrong for NASA's oral history project, said Armstrong fit every requirement the space agency needed for the first man to walk on moon, especially because of his engineering skills and the way he handled celebrity by shunning it. "I think his genius was in his reclusiveness," said Brinkley. "He was the ultimate hero in an era of corruptible men." Fellow Ohioan and astronaut John Glenn, one of Armstrong's closest friends, recalled Saturday how Armstrong was on low fuel when he finally brought the lunar module Eagle down on the Sea of Tranquility. "That showed a dedication to what he was doing that was admirable," Glenn said. A man who kept away from cameras, Armstrong went public in 2010 with his concerns about President Barack Obama's space policy that shifted attention away from a return to the moon and emphasized private companies developing spaceships. He testified before Congress, and in an email to The Associated Press, Armstrong said he had "substantial reservations." Along with more than two dozen Apollo-era veterans, he signed a letter calling the plan a "misguided proposal that forces NASA out of human space operations for the foreseeable future." Armstrong was among the greatest of American heroes, Obama said in a statement. "When he and his fellow crew members lifted off aboard Apollo 11 in 1969, they carried with them the aspirations of an entire nation. They set out to show the world that the American spirit can see beyond what seems unimaginable — that with enough drive and ingenuity, anything is possible," Obama said. Obama's Republican opponent Mitt Romney echoed those sentiments, calling Armstrong an American hero whose passion for space, science and discovery will inspire him for the rest of his life. "With courage unmeasured and unbounded love for his country, he walked where man had never walked before. The moon will miss its first son of earth," Romney said. NASA Administrator Charles Bolden recalled Armstrong's grace and humility. 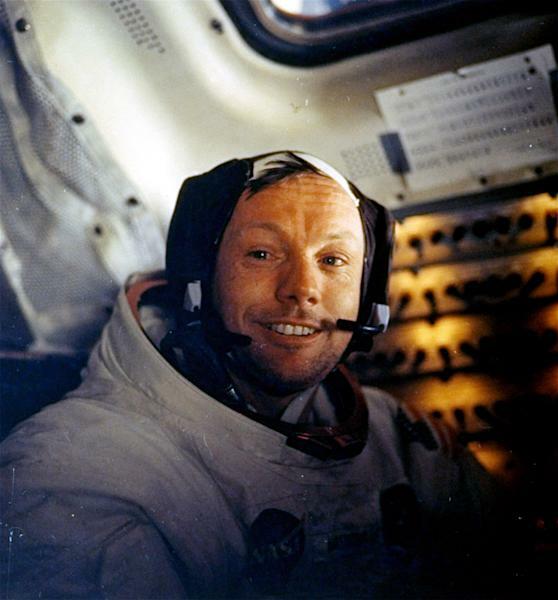 "As long as there are history books, Neil Armstrong will be included in them, remembered for taking humankind's first small step on a world beyond our own," Bolden said in a statement. When he appeared in Dayton in 2003 to help celebrate the 100th anniversary of powered flight, he bounded onto a stage before a packed baseball stadium. But he spoke for only a few seconds, did not mention the moon, and quickly ducked out of the spotlight. He later joined Glenn, by then a senator, to lay wreaths on the graves of Wilbur and Orville Wright. Glenn introduced Armstrong and noted that day was the 34th anniversary of his moonwalk. At another joint appearance, Glenn commented: "To this day, he's the one person on earth I'm truly, truly envious of." In the years afterward, Armstrong retreated to the quiet of the classroom and his southwestern Ohio farm. In an Australian interview earlier this year, Armstrong acknowledged that "now and then I miss the excitement about being in the cockpit of an airplane and doing new things." Glenn, who went through jungle training in Panama with Armstrong as part of the astronaut program, described him as "exceptionally brilliant" with technical matters but "rather retiring, doesn't like to be thrust into the limelight much." "Roger, Tranquility," Apollo astronaut Charles Duke radioed back from Mission Control. "We copy you on the ground. You've got a bunch of guys about to turn blue. We're breathing again. Thanks a lot." The third astronaut on the mission, Michael Collins, circled the moon in the mother ship Columbia 60 miles overhead while Armstrong and Aldrin went to the moon's surface. 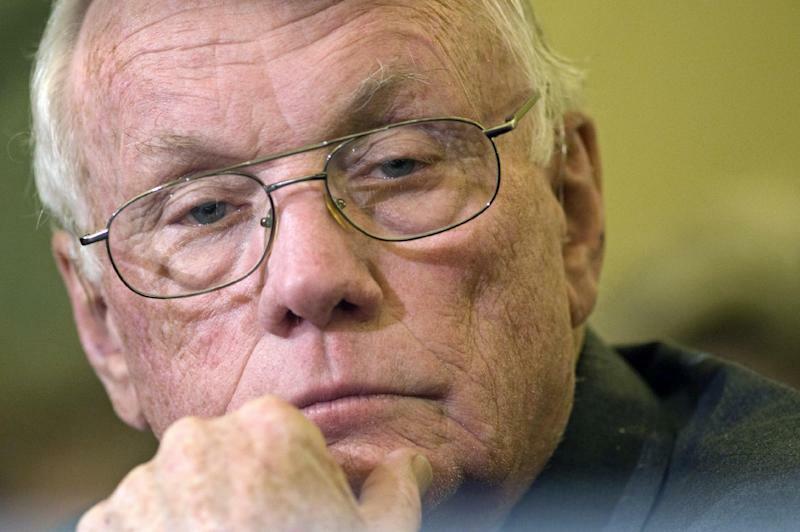 "He was the best, and I will miss him terribly," Collins said through NASA. In all, 12 American astronauts walked on the moon before the last moon mission in 1972. As a boy, he worked at a pharmacy and took flying lessons. He was licensed to fly at 16, before he got his driver's license. After the war, Armstrong finished his degree from Purdue and later earned a master's degree in aerospace engineering from the University of Southern California. He became a test pilot with what evolved into the National Aeronautics and Space Administration, flying more than 200 kinds of aircraft from gliders to jets. Armstrong was accepted into NASA's second astronaut class in 1962 — the first, including Glenn, was chosen in 1959. He commanded the Gemini 8 mission in 1966, bringing back the capsule back in an emergency landing in the Pacific Ocean when a wildly firing thruster kicked it out of orbit. "But there was that moment on the moon, a brief moment, in which we sort of looked at each other and slapped each other on the shoulder ... and said, 'We made it. Good show,' or something like that," Aldrin said. An estimated 600 million people — a fifth of the world's population — watched and listened to the landing, the largest audience for any single event in history. In Wapakoneta, media and souvenir frenzy was swirling around the home of Armstrong's parents. "You couldn't see the house for the news media," recalled John Zwez, former manager of the Neil Armstrong Air and Space Museum. "People were pulling grass out of their front yard." In 2000, when he agreed to announce the top 20 engineering achievements of the 20th Century as voted by the National Academy of Engineering, Armstrong mentioned one disappointment relating to his moonwalk. "I can honestly say — and it's a big surprise to me — that I have never had a dream about being on the moon," he said. Armstrong's is the second death in a month of one of NASA's most visible, history-making astronauts. Sally Ride, the first American woman in space, died of pancreatic cancer on July 23 at age 61. Just prior to the 50th anniversary of Glenn's orbital flight this past February, Armstrong offered high praise to the elder astronaut. Noted Armstrong in an email: "I am hoping I will be 'in his shoes' and have as much success in longevity as he has demonstrated." Glenn is 91. At the Griffith Observatory in Los Angeles on Saturday, visitors held a minute of silence for Armstrong. Borenstein reported from Washington. Associated Press writer Steve Peoples in New Hampshire and AP Science Writers Alicia Chang in Los Angeles and Marcia Dunn in Cape Canaveral, Fla., contributed to this report.